It doesn't matter who you are, what you look like, how old you are, where you're from, what you do for a living, what religion you are, your opinions, SOMEONE, SOMEWHERE loves you and cares about you. Be it your friends, your family, or some random person on the street, there's always someone that wants to see you smile, even if it doesn't seem like it. Love and affection are present everywhere you look, and if you're considering hurting yourself, for the love of God, think about this before you do it. Even if nobody you know or met cares (and I guarantee that they do), there's a million people you've never met who don't want you to hurt yourself. I know I don't. So go hug a kitten, pet a puppy, smell and give someone flowers, tell a joke, be happy. Because as long as you live, you will never, ever be alone. Remember, you are a troper. You're One of Us. Even if this is your first time on this site, even if you don't have an account, you're part of the community we have here. And we don't want to lose you. You've made it this far and we know you can make it the rest of the way. You Are Better Than You Think You Are, and we tropers are in this together. Never forget, we tropers aren't just a community, we're a family. No matter what's wrong right now, no matter how bad it seems, things will get better. I've been through this crazy rollercoaster too many times to count, and I can promise you this: it will be okay. Life has its lows, but it's not just one black pit. We're all out here, believing in you and hoping as much as we can that you'll be okay. And, all you have to do is wait. Have it be a day, five days, or much longer, you'll find out things aren't as always as bad as they seem. You want proof? Take a look at the pages for suicide, preventing suicide, Self-Harm and abuse. All of them have this message. Most of them have hyperlinks and phone numbers that will connect you with people you can talk to. None of us want you to be hurt. We want you to stand up and show the world how awesome we know you are. Listen, you guys. If you are out there, and you are scrolling through this wiki, stop for a second and think. I cannot even explain how awesome and amazing this world is, and if you want to leave it, please. Don't do it. Put the gun away, get down off the stool, put the pills back, hide those sharp objects in places where you'll never find them again. After all, no matter how alone you feel, someone, somewhere, cares about you. Hans Christian Andersen: Life itself is the most wonderful fairy tale. The only place you can truly be alone is in your own mind. No one can ever see the world the way you do, no one can ever hear the world the way you do, no one can ever have a life quite like yours and, on a molecular level, you can never truly touch anyone or be touched. Don't let it get you down, though; it simply means that no one can ever truly be a copy of you. No matter how boring or uninteresting you see yourself, you are the only you there can ever be. Technically you're never alone even if you're a loner because people are always somewhere near you. The only true way you could be alone is if you go into space, and even then people are still near you just a couple thousand miles below you. Not even that far - the International Space Station orbits the Earth at an altitude of no more than 260 miles. And at all times there are hundreds if not thousands of people in all the world's mission control centers (not just Houston and Korolyov - those two may be the biggest, but a total of 21 different centers across five space agenciesnote NASA, CSA, ESA, RFSA, JAXA are involved with the ISS), all working to make sure those single-digit-number astro/cosmo/whatever-nauts can do their job and stay alive and healthy doing it. The most alone any human has likely ever been (at least as far as we know for certain) were the pilots of the Apollo command modules, while they were on the far side of the moon and the other two were down on its surface. At those times, they were about 3500 km (~2200 miles) from the nearest other humans, and completely cut off from all contact with other humans. This is the closest anyone ever got to being truly alone - and even then it only lasted for a bit under an hour at a time. Statistically speaking, amongst the nigh-seven billion Earthlings exists a potential solacing comrade — supportive, compassionate, empathetic, sympathetic, felicitous, magnanimous, understanding, patient, simpatico, considerate, hospitable, etc. — suitable for someone somewhere, suitable for you. "[It is a signal] that there are many people in the international community who stand with them and who support them, and that change will come. [...] It's a historic method of tyranny to make you feel that you are alone. One of the things that this resolution does for people everywhere, particularly LGBT people everywhere, is remind them that they are not alone." Read: in China, there was a 16-year old boy whose life was like crap. So he eventually decided to commit suicide. However, just when he was about to do it, in front of everyone, by jumping off a bridge, a 19-year old woman rushed to stop him. She told him that she was going through a rough time, just like he was, and showed him the scars on her right wrist to testify. She said that she considered suicide, but didn't go through with it and she didn't want him to do it either. And then she hugged him and kissed him. All the examples in that article are about someone reaching their lowest point but being brought out of it by some chance event or intervention — a friendly phone call out of the blue from someone who just wanted to chat, happening to hear a song that struck a chord with them, even a friendly puppy. The moral here is not to go around giving puppies to depressed people, because surprise gift puppies are always a bad idea. The point is that a person is driven to suicide by a whole bunch of different things, which build a wall around them, piece by piece, until the last piece falls into place and the wall is sealed so that there's no way out. Sometimes we look at all the problems that build up someone's wall of hopelessness and think there's no way any of the insignificant things we could do would be able to take it all down. But to break the illusion of there being no way out, you don't need to take down the whole wall, you just need to make one crack in it. One puppy lick, one phone call from Laila Ali, one corny song, one Internet stranger, one old Australian guy asking if you want to come in for a cup of tea. And one crack in that wall might be all it takes to turn things around and begin the long, tough job of tearing the whole thing down. The four Warrior Ethos of the United States Army are as follows: 1. I will always place the mission first, 2. I will never accept defeat, 3. I will never quit, 4. I WILL NEVER LEAVE A FALLEN COMRADE. Pretty much every soldier worth his/her salt knows that without the fourth one, the other three are worth jack-monkey-squat. And of the seven Army Values, the first one is LOYALTY. In 1989, 96 Liverpool fans were crushed to death in the Hillsborough Disaster, the worst sporting disaster in European history and (excepting the Lockerbie Bombing) the worst loss of life on British soil since World War II. Condolences flooded in from all around the world, including from US President George H.W. Bush and Pope John Paul II. Other clubs played a significant part, with a minute's silence held before the Champion's League Semi-Final between AC Milan and Real Madrid being broken by AC Milan fans, who spontaneously starting singing Liverpool's club anthem You'll Never Walk Alone. Never has that song been more appropriate. To this day, the day is marked with moments of silence in league matches all over Britain and clubs around the world and the Hillsborough memorial is invariably decorated by the scarves of fans from clubs from all over the country and the world. There's even an annual memorial service in the battlefield of Spion Kop in South Africa, which lends its name to the famous Kop Stand at Liverpool's home stadium. After the inquiry into the Hillsborough disaster ended with the police condemned for mismanagement of the with tragic results, vindicating the families of the victims who had insisted that the fans were smeared by the press and the police, Newcastle United insisted on a minute's applause for 'the victory of truth' at their next home game, in large part because their manager, Rafael Benitez, had been manager of Liverpool (and remains a revered figure by the club's fans) and had been closely associated with the cause of the the families, donating £96,000 ($140,260) of his own money to the Hillsborough Family Support Group in 2010, before donating a further £2,800 via his wife's charity in 2011. During that minute of applause, the Newcastle fans sang You'll Never Walk Alone, Liverpool's club anthem and epitome of this trope. In 1993, the Great Midwestern Flood, a tiny Asian country (whose name I'm sorry to say I can't remember) that we had been helping after it had been devastated by flooding after particularly brutal Monsoon rains turned around and sent aid back to the US. The September 11 attacks are living proof of this trope in action. The day after September 11th, Queen Elizabeth had the guards outside Buckingham Palace play The Star Spangled Banner during the changing of the guard instead of the usual God Save The Queen. This is the only time in the history of the ceremony that any anthem other than God Save The Queen has been played during the changing of the guard. In returning the favor, after the Manchester concert bombing, a Major League Baseball game started out not with The Star Spangled Banner but with God Save the Queen . Appropriately enough, it was a Yankees-Royals game. A Kenyan Masai tribe offered the US a herd of 14 cows, an enormous gesture for people arguably in much worse straits than we were. note Also, the culture of this tribe placed cows as their highest resource and they were blessed by the tribe's elders. In its editorial reaction to the events, the French newspaper Le Monde asserted that on that day "We are all Americans!" Many of the other international reactions to the events of that day — such as the aforementioned Changing of the Guard at Buckingham Palace — were intended to send the same message. Firefighters, paramedics, police officers, businessmen/women - everyone on that day banded together to combat the tragedy. A similar response took place after the 7/7 bomb attacks in London. The US Army band played God Save the Queen outside the British Embassy in Washington DC as the State Department lowered its flag to half mast and President Bush signed the condolence book in London. Australia, New Zealnd, Canada and France all flew their flags at half mast. The European, Polish and Irish Parliaments all held a minute of silence. Russians laid bouquets of flowers outside the British Embassy as a human chain of solidarity was formed by staff and locals during a minute's silence. God Save the Queen was played at the changing of the royal guard at Plaza de Oriente in Madrid in memorial to the victims of the attack. In World War II, the United States played this role for the British, Chinese, French, and Russians. It didn't officially enter the war until the winter of 41/42, but ever since the mid-30s, China had been receiving aid, and the French, British, and Russians soon after Hitler's Germany began warring against them. Most of this was through Lend-Lease, but some very specific examples of direct assistance in the Liberty Ships, the Eagle Squadrons in Britain, and the American Volunteer Group (famously, the Flying Tigers) in China. The US did this again when the Indonesian Quake struck. French Admiral: What are you going to do with an aircraft carrier? Bomb it? Response: Our aircraft carriers generate enough power to provide electricity for 3,000 homes without affecting operations, have a fully equipped medical facility capable of emergency treatment, water purification facilities, the resources to airlift food and supplies and we have eleven of them. How many does France have?note They have one , significantly the only CVN ever built by another country. Oh yes, it's very nice. They did it again after the earthquake in Japan. And so did the rest of the world . The Canadian ambassador to the United States said these words after Hurricane Katrina. "You are our friends and together we are family  you do not suffer alone." "The science known as SETI deals with searching for messages from aliens. METI science deals with the creation of messages to aliens... In contrast to Active SETI, METI pursues not a local and lucrative impulse, but a more global and unselfish one  to overcome the Great Silence in the Universe, bringing to our extraterrestrial neighbors the long-expected annunciation You are not alone!"
We already have a handful of space signals that we can't identify, the most famous being the "Wow!" signal. It's been verified that the signal could not have come from a satellite or anywhere on Earth. If it's extraterrestrial, it shows that we are not alone in our desire to find others like us out there. Perhaps, the aliens want to make friends, too. In any form of rescue, one of the first priorities is establishing communications, in any way possible. As many people who have been rescued will tell you, the importance isn't what's said, but the simple message the communication implies: "We know you're there. We're coming." When something goes wrong, you are not alone. Paramedics, EMTs, Firefighters, and Police Officers all share one common goal: that others may live. If there is a life to save, nothing will stand in their way to do so. There are even documented cases of responders manually lifting trucks off of victims to pull them from danger. And the funny thing is that they don't view themselves as heroes. It's either another day on the job, or a case of doing what they'd want their fellow man to do for them. The Please Don't Jump movement. Someone posted a secret on PostSecret that they were going to kill themselves by jumping off the Golden Gate Bridge. People around the world started an online movement to convince them not to. The members around San Francisco even went to the bridge to write uplifting messages in case the original poster hadn't seen their online messages. Dogs. Essentially man's best friend, a dog doesn't care about how rich or poor, old or young, successful or not its master is. Dogs love unconditionally, and will stick with their master to the very end. Senator George Vest: "The one absolutely unselfish friend that man can have in this selfish world, the one that never deserts him, the one that never proves ungrateful or treacherous is his dog." Pets in general. You take care of them, and for most of them, they can't leave you and they wouldn't want to. The IMAlive project - an instant messaging version of a suicide helpline. Trained volunteers are there 24/7, just to chat with those who need it. We can help you get through this. Please know that you are not alone. "I feel exactly the same way, you're not alone ♥"
"Yeah, that not-alone feeling? Is one of the best feelings in the world. :)"
"To all my brothers and sisters who made it back, but never made it home. In memory of those who have died from physical and emotional wounds received while serving in the Vietnam War. We honor and recognize their pain and suffering, but above all we respect the courage of these Washington State residents. When our country called, you were there. We have not forgotten, you are not alone. You Now Rest in Glory"
Anyone who can claim the title "United States Marine" has 240,827 men and women who will ensure that they will never be alone. And that's just counting active and reserve units. You the mothers who sent their sons from far away countries, wipe away your tears. Your sons are now lying in our bosom and are in peace. Having lost their lives on this land they have become our sons as well." While the message has since been revealed as apocryphal, it has also long since been adopted by Turks, New Zealanders and Australians alike as a kind of fundamental truth. Your sons will rest a thousand years. The Civil Air Patrol of the United States continues to exist, in part, due to this trope. From search and rescue to disaster relief, their personnel are constantly bringing aid to those who are isolated or in danger. Why is that? Because they want to. They are volunteers. Hell, some of them are not even adults! Yet, you can rest assured that if something terrible has happened and you are lost in the world, there is a chance they will come for you. En masse. The American flag for the Prisoners of War and Missing In Action, seen here ◊ has the phrase "You Are Not Forgotten." A reminder to those who are trapped behind enemy lines or lost, while America, both the civilians and military, may not be with you physically, we are with you in spirit and we will ensure you are returned home. Rather oddly (to outsiders) there are lawyers' assistance programs in every state of the US. This actually has a reason: Those in the legal profession are statistically more likely to become depressed, attempt suicide, or become drug/alcohol addicts than any other employment-based group in the country. Furthermore, the special position of lawyers in society—mediating the relationship between citizens and the state—means that it is particularly important for lawyers not to have these problems. As a result, every state bar association runs a program part of whose purpose is to assure every attorney, law student, and judge: You are not alone in this. One of the talking points in the "Be a Buddy, Not A Bully" program has "You are not alone" as one of the things a "buddy" could talk to the bullied individual about to make them feel better about himself or herself. The Golden Gate Bridge is by far the most popular place in the world to... commit suicide. A highway patrol officer named Kevin Briggs has made a career out of saving would-be jumpers. His empathy and unwillingness to give up have saved hundreds of lives. On a similar note, Don "The Angel of the Gap" Ritchie . He lived next to a cliffside in Sydney, Australia where suicides were extremely common. For 45 years, Don watched the cliff for jumpers and would invite them to his home to talk. Officially, he was credited with saving 160 lives and his family estimate the number may have been closer to 500. The underlying message of Forest Rain 's My Little Pony: Friendship Is Magic-inspired "'Great to be Different' Community Video" is not just celebrating difference but showing that there are others who have struggled with self doubt and have come to be proud of who they are. It's also an affirmation that there are people out there who won't look down on you based on what TV show you watch. "I just wanted to tell you that the hardest thing I faced wasn't the teasing or the pain. It was convincing myself I wasn't stupid strange or lame, and helping others do the same." After a bomb went off at the Boston Marathon on April 15, 2013, Ellen Degeneres had this to say to the city of Boston. The Yogscast's Zoeya knows what it's like to hurt . Zoeya: Each and every single one of you, you all deserve to be happy. Never give up. And smile more because you really do look beautiful when you smile. Military. Police. Firefighters. Coast guard. Border guard. Jail guard. These are people whose dayjob is ensuring you can sleep safely at night. I'm not afraid. My friends are scarier than he is. When serious natural disasters strike, especially when they strike impoverished countries, expect international aid (UN or otherwise) to be forthcoming. Some NGOs like Doctors Without Borders and the International Red Cross also brave these places to bring aid to those in need. When Mother Nature herself smites you with her wrath, remember You Are Not Alone. There are those who will come to your aid and there are even samaritans who make it their life's work to do so. When things get bad, Iran and the United States are ready to help each other out , revealing that beneath all the name calling the alleged mortal enemies are really something closer to Friendly Worthy Opponents. Lots of Iranians even love Israel, and Israel loves them back . There's no Up To Twelve trope, which is what it might take to describe South Korea sending North Korea—which it's legally still at war with—emergency food aid (and Choco Pies ). Little girl wants to know how to deal with being called a nerd, Wil Wheaton responds. When Ronald Reagan was brought to the hospital from his attempted assassination in 1981, he said to the surgeons "I hope you're all Republicans. ", to which the chief surgeon, Dr. Joseph Giordano (a Democrat), said "Mr. President, today, we're all Republicans." After Robin Williams tragically took his life, Cracked, a website known mainly for its irreverent snarky humor, revealed that they have a system in place in case any of their commenters express suicidal thoughts. They will send such commenters messages of support, and in some cases even dispatch emergency services to their location. So if even Cracked likes you and doesn't want you to hurt yourself, you are definitely not alone. Ugol's Law holds that no one is ever alone in their kink. It's easy to have a rare fetish, to be unable to find anyone to share it with, even to feel that the whole world looks down on you for it. But the consensus of kinksters is that there's someone else out there with the exact same one. In December 2014, a gunman took hostages at a cafe in Sydney, Australia. Amid uncertainty about the hostage-taker's motives and fears of reprisals after a flag bearing the Islamic proclamation of faith was raised in the cafe, some Australians created the hashtag #illridewithyou in a bid to show solidarity with local Muslims who might feel threatened by backlash. During a promotional screening of Furious 7, Vin Diesel started to break down while talking about costar Paul Walker, who died during production, when an audience member said "You've got family here, Vin!" In 2014, middle school student and lacrosse player Braeden Lange came out publicly as gay when he discovered his friends' negative views on homosexuals. Although shunned and ridiculed by classmates initially, to the point of depression, his father discovered a profile from ESPN from 2005 of Andrew Goldstein, then a Dartmouth College lacrosse player who would eventually become the first gay athlete to play professionally in a team sport (in his case, Major League Lacrosse). The video quickly reversed Braeden's depression, and he felt better about himself afterward. Later, Lange and Dr. Goldstein (now a cancer researcher at UCLA) would meet, and Dr. Goldstein would organize the Courage Game , a lacrosse exhibition in connection with the NCAA Division I Lacrosse Championship, for homosexual athletes and their allies (regardless of orientation) to honor gay athletes, particularly Braeden. In the wake of the 11/13/2015 ISIS attacks in Paris, the lights of the Eiffel Tower were turned off as a sign of mourning. 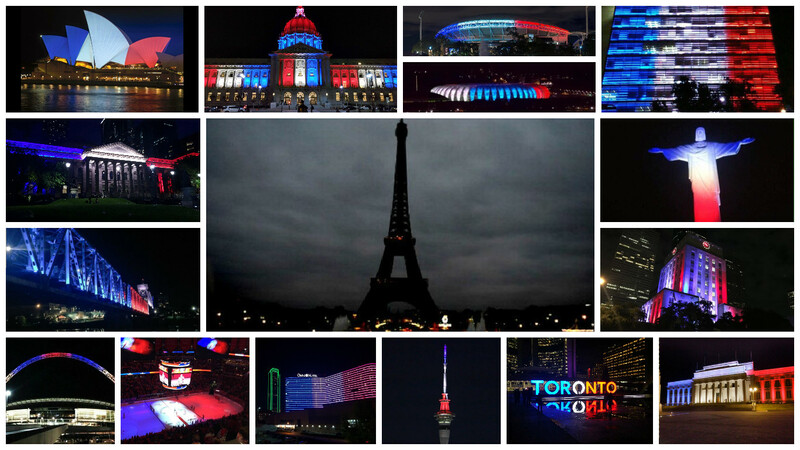 The rest of the world responded by lighting up various buildings in the color and pattern of the French flag. ◊ "The whole world stands with Paris tonight" indeed! A couple of days later, when the French national football came to England to play a scheduled friendly against a team who it should be remembered are their oldest rivals, something that stretches back most of a thousand years, innumerable wars and sporting competitions... they were welcomed to Wembley, the home of English football, with the entire stadium lit up in red, white and blue, the motto of the French Republic emblazoned on the side, the usual vast St George's Cross made of cards held up by fans at the home end replaced with the French tricolore and thunderous roar of all 90,000 fans in the stadium singing 'La Marseillaise'. Moreover, as a result of the vast surge of public outrage, two weeks later the previously reluctant British Parliament voted to begin bombing raids against IS with immediate effect. He closed each episode with the words: "You make each day a special day. You know how; by just you being yourself. There's only one person in the whole world like you. And people can like you just the way you are." note Yes, of course he meant you. You, specifically, were very special and important to Mr. Rogers. And you know what? He was right. "When we can talk about our feelings, they become less overwhelming, less upsetting, and less scary. The people we trust with that important talk can help us know that we are not alone. ... If you could only sense how important you are to the lives of those you meet; how important you can be to the people you may never even dream of. There is something of yourself that you leave at every meeting with another person." There may be no therapists in fiction, but in real life many people devote their entire careers to being there for people who need emotional support, or mental or physical health care, or just a helping hand. Same goes for social workers, clergy, first responders, charity workers, teachers, heck the entire service industry— if you stop and think about it, the amount of people who want to spend their lives helping you when you need it is truly impressive. During World War I, the French village of Villers-Bretonneux was liberated twice by the ANZACs, at the cost of around 1,200 lives. While the village was saved, the schoolhouse was destroyed by artillery fire. In response, schoolchildren from the state of Victoria, Australia, many of whom had family that died defending the village, helped raise money to build a new school. When it was built, a sign was erected above every blackboard that said "N'oublions jamais l'Australie," which means "Let us never forget Australia." Fast forward to February 2009, when the Black Saturday bushfires severely damaged the town of Strathewen, Victoria. Upon hearing the news, the children of Villers-Bretonneux put together a fundraiser to help the people of the town rebuild. When asked about it, one of the children simply said, "Nous n'avons pas oublié les Australiens." We have not forgotten the Australians.